Meshmixer makes it easy to design solid parts that fit the detailed contours of 3D scans, while also incorporating precise mechanical features. This is very useful in Health and Medical applications, where practitioners can scan a person to create a patient-specific 3D model, and then use this model as a basis to create custom-fit devices and aids. 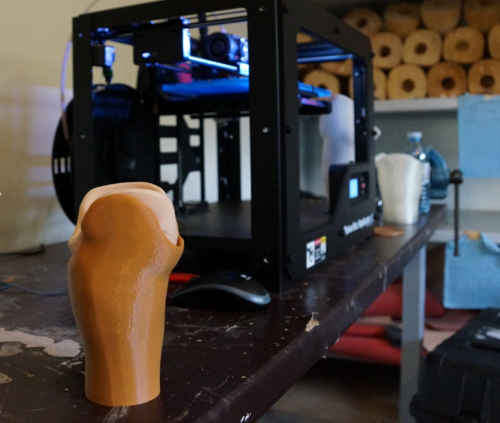 The 3D PrintAbility project aims to create a scalable process for manufacturing prosthetic sockets for children in the developing world. First an inexpensive 3D scanner is used to acquire the 3D shape of the residual limb. Then Meshmixer is used to design a socket that will fit the limb, and interface with a standard Red Cross post/foot assembly. Finally a consumer FDM 3D printer is used to fabricate the socket. The goal of the project is not to produce cheaper sockets, but rather to reduce the turnaround time to a single day, rather than the week it takes with the existing plaster-cast-based process. This is critical because there are not very many prosthetic technicians in the developing world, so time is the largest factor in determining how many children are able to be fit with sockets. 3D PrintAbility began as a collaboration between CBM Canada and the University of Toronto's Semaphore Lab, funded by Grand Challenges Canada. Autodesk Research contributed expertise in scanning and printing, and added several features to Meshmixer to support the project. In January 2015, Ryan Schmidt (one of your Meshmixer developers!) travelled to CoRSU Rehabilitiation Hospital in Uganda with the team. Successful field trials of the socket design process were conducted, and 4-year-old Rosaline was the first child to walk with a 3D-printed socket. During 2015 many more sockets were tested, and Nia Technologies was formed to further develop the process. The Autodesk Foundation is helping NiaTech to scale this technology across the developing world. 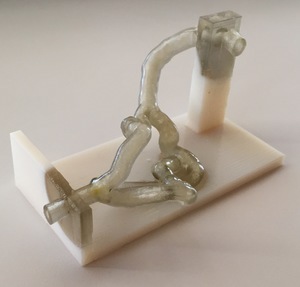 At the Toshiba Stroke and Vascular Research Center in Buffalo NY, Dr. Ciprian Ionita and his team have developed a novel method to create 3D-printed vascular models (or "phantoms") using Polyjet printing technology from Stratasys. The polyjet process can create flexible objects that mimic the feeling of human tissue. Neurosurgeons are using these models for planning complex procedures such as repair of brain aneurysms.